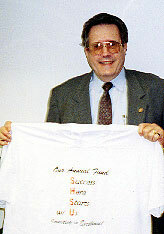 Hayes presents Jim Stevens, associate vice president for information resources, with a t-shirt in recognition of his becoming the first university employee to enroll in the payroll deduction feature of Sam Houston State University's first Success Here Starts with Us (SHSU) faculty/staff annual fund campaign. 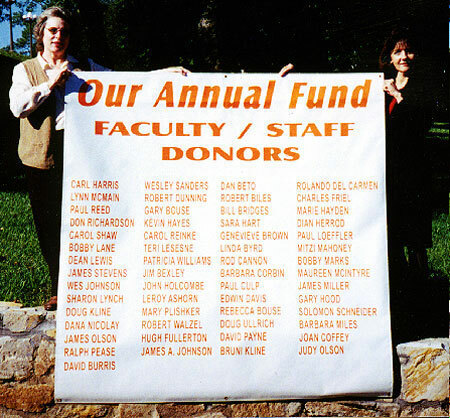 Lynn McMain, right, instructor in the Newton Gresham Library, said she was giving to the Success Here Starts with Us (SHSU) faculty/staff annual fund campaign because "the reason for giving is standing next to me, the students." 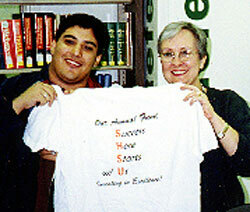 Student Steven Olson helped McMain display her shirt. Robert Dunning, registrar, had thoughts along the same line. "The annual fund campaign is a wonderful opportunity for members of the academic community to support the scholarship programs and activities provided by Sam Houston State University," said Dunning. Carol Shaw, secretary in the accounting department, was downright combative about her reason for participating: "Our faculty and staff can't be out-matched by Southwest Texas and Stephen F. Austin," she said. 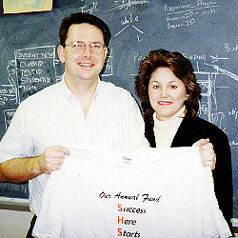 Annelise Ahrens earned her shirt by being one of the first in the Business Office to participate. 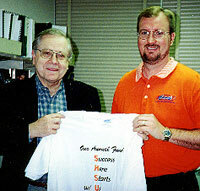 Drive coordinator Hayes is hoping for a high participation percentage in all SHSU units. 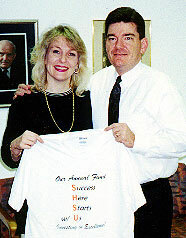 Doug and Bruni Kline, management department and university advancement employees, left, and Rebecca and Gary Bouse, music and university advancement, right, are couples in another SHSU group--Spouses who Help Support our University. 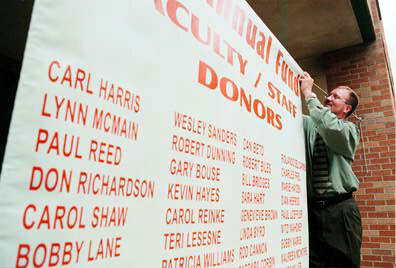 Patsy Wuensche, left, and Carol Reinke, university advancement, hold up the banner with names of early donors. More names are being added daily.